You should be afraid…very afraid. You might not be aware, but Halifax is absolutely swarming with ghost stories, and Dalhousie is no exception. Read on to learn more, if you dare! 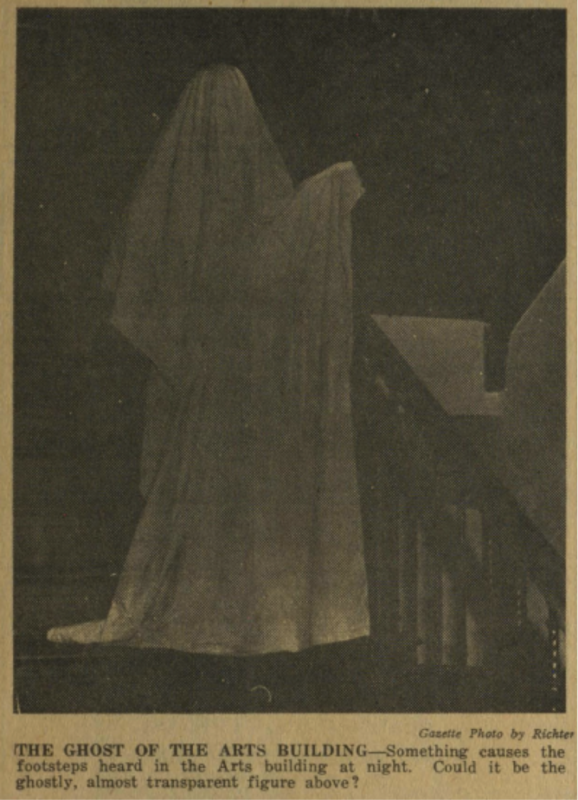 The oldest and most famous ghost story on campus is that of Penelope, the ghost girl of Shirreff Hall. The legend has circulated around campus for decades, and has been featured in several books of local ghost lore. Reports in the Gazette—and more recently in online articles and discussions—have been fairly consistent over the years. Penelope is said to be a chambermaid who worked in the Shirreff Hall shortly after it opened in the 1920s. According to most versions of the story, Penelope had an affair with a professor that ended in pregnancy. He abandoned her, and she hung herself in despair. Penelope’s manifestations also seem to follow a general pattern across the stories: lights and electronic devices turning on and off by an unseen hand, doors unlocking and opening by themselves while the key-holding residents were in the room, strange temperature changes, disembodied footsteps running down the hall, and even actual sightings of Penelope, who witnesses describe as beautiful woman in a blue dress. There doesn’t appear to be any mention of the tragedy in the Gazette in the 1920s—though something so dark and scandalous might not have made the paper of the day. The earliest thing to a possible reference is a joke in a humour column from the 1930s in which the author writes “Please, please, let nobody discourage the practice of window-hanging (a method of viewing the neighbourhood, not of suicide) at Shirreff Hall.” Unfortunately, it’s impossible to say whether this is an allusion to the real-life Penelope, an early reference to the rumoured haunting, or a simple coincidence. For all of her local fame, Penelope hasn’t made very many appearances in the Gazette—the first article about her appears to be a science column written in 1994. Back in February 2008, the Gazette published a story about a second year journalism and international development student who claimed to have seen a ghost in her residence room. The student lived atop Cochran Bay. She claimed that strange occurrences had begun a day before the sighting, when she had started hearing a strange, whispering voice in her room. She unplugged her television, turned off her radio and computer, and shut her windows, but she could not locate the source of the voice. The student carried on with her classes as usual that day. When she returned that night, she had difficulty falling asleep, in part due to the persistent reappearance of the voice, and in part because she couldn’t shake the feeling of being watched. She felt as if she could just barely see something moving about the dark room at the corners of her vision. At around 3:00 a.m., the student got out of bed to grab some water from her mini-fridge across the room. When she sat back down on the bed, she realized she was not alone. The ghost of a teenage girl had appeared next to the bed, not three feet from the student. The ghost remained in place for about ten seconds before vanishing. The student had a librarian help her conduct some research in the King’s archives for information about possible deaths in the building, and claimed to have found information about a maid who died some sixty years earlier, found hanging in the ‘roost’, which was separated from the student’s room by nothing more than a wall. On March 22, 1949, the Gazette featured a front-page story about the ghost of the “Studley Arts Building” — the same building that now houses the University Club. The Gazette had its office in the building at the time, so four Gazette staffers spent the night locked inside to investigate. “Determined to find a mechanical cause” for the noises, they came up empty handed, concluding that it wasn’t a pump or the radiators. They reported haunting footsteps that switched floors whenever they attempted to investigate the source. When they split up and attempted to cover both floors, the footsteps stopped altogether. John Hillman is the Gazette's Opinions Editor. John is a second-year law student, but he has been at Dalhousie for much longer than that. Recently discovered cave paintings indicate he was first observed lurching around campus by Halifax’s original human settlers some time during the late Pleistocene epoch. He started writing for the Gazette back when you were in elementary school, but he unexpectedly went off the grid a half-decade ago to concentrate on helping found Punditry.ca, a DSU-focused political blog. Where exactly was he hiding between the years 2009-2013? Certain individuals would prefer he not comment. Why has he returned? Not because of a top-secret Illuminati indoctrination project known only as the Omega Initiative, that’s for sure. You can email John at opinions@dalgazette.com.